Coming off the success of A Trick of the Tail, Genesis did not loiter long before staring recording sessions for their eighth studio album. Perhaps they were trying to consolidate the new Peter Gabriel-less quartet or maybe there was material left over from Trick. Or it was simply a period of great creativity. Whatever the motivation, Wind And Wuthering was released in the same year as its predecessor, just around Christmas 1976. Opening grandly with the expansive historical sweep of ‘Eleventh Earl Of Mar’, you know you are in classic Genesis territory. Although a Banks/Hackett/Rutherford co-write, Tony Banks’ keyboards dominate, freshened by the subtle guitar parts of Steve Hackett. Fans of mid-70s progressive music can settle back in their comfy chairs and soar on this melodic and enjoyable music. Same could be said of the next track, ‘One For The Vine’, a Banks song with messianic overtones and plenty of changes in pace and timbre to keep things interesting. In the wrong mood this one comes across as overblown and self-important, but taken as a Sunday matinée epic story, it’s fine. Munch the popcorn and enjoy. Then something unexpected happens. ‘Your Own Special Way’ is nothing more or less than a love ballad, sporting a pretty chorus and rippling 12-string guitar. It’s a Mike Rutherford song made slightly less ordinary by the extended instrumental middle section before the chorus returns for one last sing-along refrain. As if to contrast this sweetness, the final track on side one is an energetic Banks-Collins jazz-rock instrumental called ‘Wot Gorilla?’ that showcases the outstanding percussive skills of the latter within a keyboard driven framework. Side two is strong throughout, opening with Banks’ entertaining ‘All In A Mouse’s Night’, a fully progged up composition that displays a bright vein of slightly dark humour. ‘Blood On The Rooftops’ teams the compositional skills of Hackett and Collins to good effect, beginning with delicate acoustic guitar and developing into string accompanied journey of reverie and memory. Instrumental double ‘Unquiet slumbers for the sleepers…’ (Hackett/Rutherford) ‘…in that quiet earth’ (Hackett/Rutherford/Banks/Collins) taps into the gothic romance of Emily Bronte’s Wuthering Heights for a satisfying English interlude of mystery and majesty before the Tony Banks ballad ‘Afterglow’ ends the album on a romantic note. 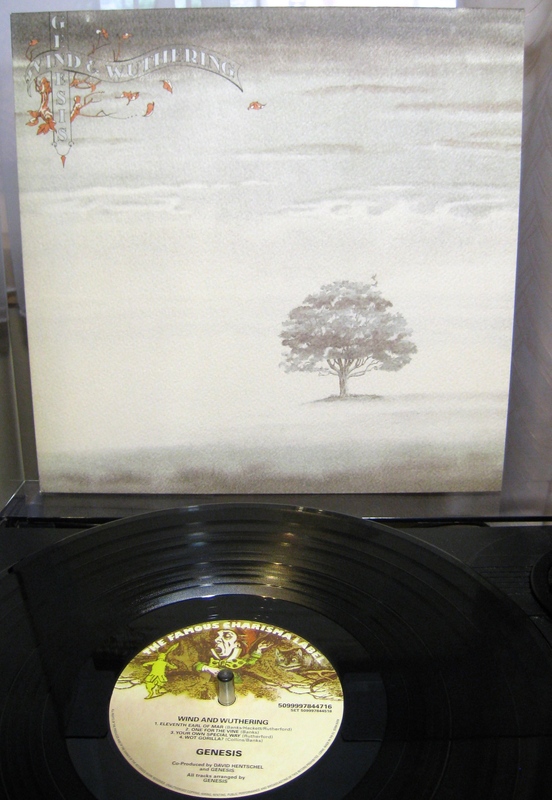 Wind And Wuthering was the last album Steve Hackett made with Genesis before departing for a solo career. Although he was heard to mutter about the lack of space for his own compositions (it is a Banks bonanza here), the guitarist has also named W & W as his favourite Genesis album. It’s probably not in medal contention for me, but it is a very good record and very satisfying on a chilly autumn afternoon. * Recently I have been enjoying photos of vinyl albums posted in a Facebook group by one Wilma Lee Snavely Crockett. Some of them have been just terrific, showing an awareness of the music and colourfully celebrating the cover art. 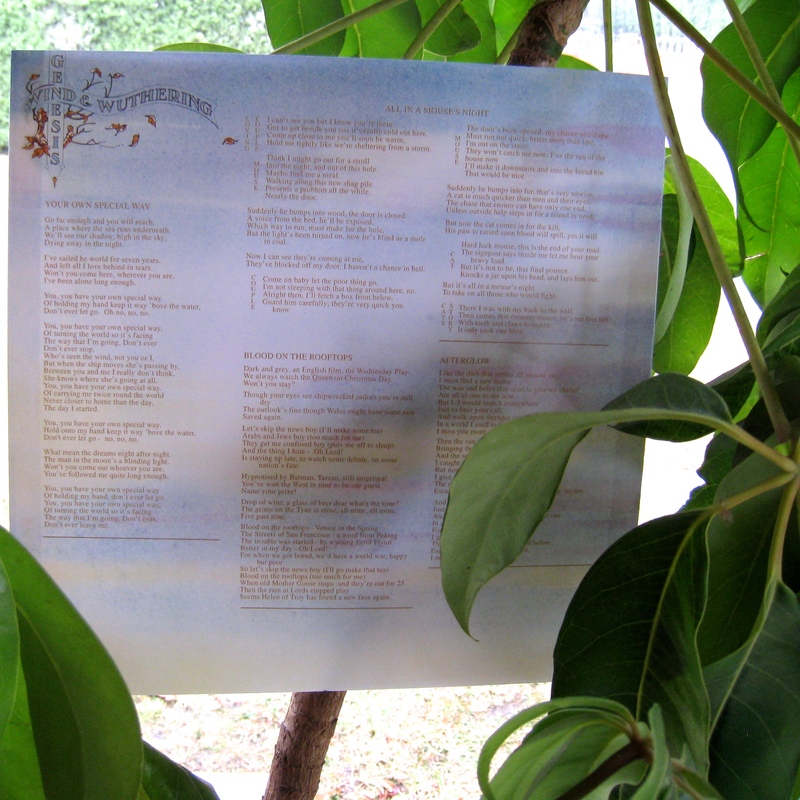 This one I liked so much, I decided to write a brief Vinyl Connection piece as acknowledgement of both the music and Wilma Lee’s photo. I love that album too. Including “Your Own Special Way”! Sure. It’s a fine ballad. Just seemed a significant shift for someone who’d become committed to Genesis via ‘Genesis Live’! My third-favorite album by the band, and their best after Gabriel’s departure. ‘Trick’ is a bit too twee for my liking; this one is meatier and more interesting cut-by-cut. Hackett’s intro to “Blood on the Rooftops” is one of their signature moments. Know what you mean about Trick. ‘Robbery’ is too musical hall for me while ‘Mad Man Moon’ is rather syrupy. But ‘Dance on a Volcano’ and Squonk are amongst Genesis highlights and make Trick an equal to Wind in my notional favourites list. Thanks for contributing to the dialogue! Meant to say, before I started digging down into song detail, I fully agree that Wind & Wuthering is one of the most all-round satisfying Genesis albums. A band I’m not familiar with, though this is the second piece I’ve read that’s got me interested (the other by Mr. 1537 a while back). A different experience of Genesis will be had depending on whether you start with the later commercial pop-orientated stuff (e.g. : ‘Invisible Touch’) and work backwards, or begin at the beginning with the complex, often edgy progressive material (e.g. : Genesis Live, my intro) and work forward. Certainly worth investigating if you enjoy UK prog. I think I’ll listen to the earlier stuff. Certainly don’t care much for the stuff I’m aware of (that pop-orientated commercial shenanigans). Good word duly noted, Bruce! (added a few to Discogs for me to sift through in due course). Beeing in “love” with everything PG, Genesis without is hard for me, but i can admit to this beeing a fine album. Agreed. It is a Genesis album PG fans can still enjoy. Good take. Agree. I was still hanging around the band. The music sounded good.